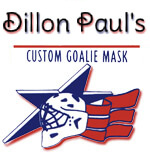 Welcome to DillonMask.com, home of the finest custom ice hockey goalie masks in the world! WELCOME TO DILLON'S CUSTOM GOALIE MASK! After an absence of several years, I started to play hockey again. In an effort to upgrade my equipment I purchased a "one size fits all" goalie mask. It did not meet my expectations and because I had over 18 years experience with fiberglass, I knew I could make a better one. That's how I began to produce goalie masks. With each new hockey season, the number of goalies wearing a Dillon's has increased, which means that our product is being exposed to goalies and equipment managers in all levels of the sport. Goalies wearing our mask have been extremely successful - winning everything from championships in the ECHL and RHI to awards such as MVP and Rookie of the Year. Goalies count on Dillon's to produce a top-quality mask that protects them. No matter at what level you play, we are committed to providing you with the best product, price and service in the industry. Give us a try and discover what wearing a Dillon's Custom Goalie Mask is all about. WHY THE CUSTOM FIT IS BETTER. The key to our mask is that each one is custom made to fit the individual user. Everyone's head is different. For example, if two individuals, both with a hat size of 7 ¼", are molded, you may see two different head shapes. Some individuals may have a more oval head while another more rounded or they may have different forehead slopes. By purchasing a custom fit mask, the mask will be shaped to the individual head allowing for a more comfortable fit. You can also specify a different chin length or distance of cage from nose. Energy dispersal from puck impact is transferred evenly because of the even fit to the head. Another distinctive feature of the mask is that it is made to channel energy more efficiently after puck impact. This is because of the unique way the composites are laminated together in shell construction. That means there is little or no "ringing" in the ears following a hard shot. HOW DO I GET MOLDED? We have a face mold kit with instructions that can be purchased for $25.00. Please send check or money order payable to "Dillon's Custom Goalie Mask." You can send an email and request a list of materials and instruction sheet. Dillon Mask Custom Goalie Mask, Ltd.